The Saint Bernard (also ‘St Bernard’, ‘St Bernhardshund’, or ‘Alpine Mastiff’) is a massive Swiss breed descending from the Roman Molossar and indigenous Swiss breeds. It was adapted in the seventeenth century to the purpose of mountain rescue at the Saint Bernard Hospice (named after an 11th century monk) in the Western Alps. The Saint Bernard would find lost travelers, lick them, and lie near them to warm them (they did not carry small barrels of brandy from their necks, as is often portrayed). The Saint Bernard continued in this role for centuries, saving thousands of lives. Prior to the 19th century the Saint Bernard was known as the ‘Saint Dog’ or ‘Barry Dog’, after a Saint Bernard from the early 1800’s who saved over 40 lives. Saint Bernards decreased in numbers in the 1800’s due to disease (and, by some sources, avalanches). They were crossed with the Newfoundland and other breeds to improve their numbers, introducing a long-coated variety. Today, the Saint Bernard is among the most popular large breeds. Famous Saint Bernards include Stephen King’s ‘Cujo’…actually, never mind— Famous Saint Bernards include Beethoven, hero of the ‘Beethoven’ series of films and Bamse, mascot of the Free Norwegian Forces in World War II, who served on board a navy ship and was awarded the ‘animal’ George’s Cross. Bamse was known to ride the bus to the local watering hole by herself and bring crew members back to the ship before curfew. The Saint Bernard has a shoulder height of 65-70 cm (25-28 in) and weighs at least 60 kg (132 lbs), up to 136 kg (300 lbs). The largest Saint Bernard on record, Benedictine, weighed 162 kg (357 lbs)! Saint Bernards have a large head with large upper lips (‘flews’), short, deep muzzle, and wrinkled forehead. They have a flat back, muscular legs, a broad, low-carried tail, and large feet. The Saint Bernard is a large powerhouse of an animal. The Saint Bernard can be rough or smooth haired. It is white with possible markings of black, red, brindle, tan, or a combination thereof. Most Saint Bernards have black ears. Show dogs must have white legs, chest, collar, tail tip and blaze (vertical line between the eyes). The Saint Bernard sheds twice a year. The Saint Bernard is friendly and good-natured. It will defend its owner and territory when threatened. The Saint Bernard is intensely loyal. It is likely to slobber. The Saint Bernard is friendly and good-natured. It will defend its owner and territory when threatened. The Saint Bernard is intensely loyal. It is likely to slobber. The Saint Bernard is friendly with children, other dogs, and household pets. It is playful and adventurous. You can find St Bernard puppies priced from $250 USD to $3000 USD with one of our credible breeders. Browse through our breeder's listings and find your perfect puppy at the perfect price. The Saint Bernard is friendly with children, other dogs, and household pets. It is playful and adventurous. Both coat types of Saint Bernard require weekly grooming with a brush and comb, more often when shedding. Bathe only as necessary. The ears must be kept clean and eyes checked regularly to prevent infection. The Saint Bernard has a lifespan of only 7-10 years. It is susceptible to hip and elbow dysplasia (malformed joints which can cause lameness or arthritis), which can be aggravated by obesity. Proper exercise and nutrition are important. 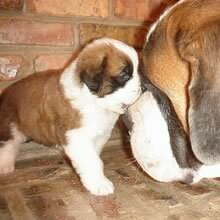 The Saint Bernard is susceptible to epilepsy and eyelid disorders such as entropion and ectropion. Saint Bernards should be taught not to pull on the leash when young because they will grow to such large size. Patience must be exercised in training as the Saint Bernard can be stubborn. Saint Bernards require daily exercise, but not an enormous amount as one might assume from their large size. Moderate walks or runs will keep them satisfied; they should be exercised enough to keep them from growing obese. The Saint Bernard will occasionally appreciate a longer walk or a chance to run free. St Bernard Puppies for Sale - Shipped Worldwide! Finding the right St Bernard puppy can be dog gone hard work. PuppyFind® provides a convenient and efficient means of selecting and purchasing the perfect St Bernard puppy (or St Bernard puppies) from the comfort of your home, 24 hours a day, 7 days a week. Take advantage of our PuppySearch or leisurely browse our directory of hundreds of dog breeds, St Bernard dog breeders, St Bernard dogs for adoption, and St Bernard puppy for sale listings with photos and detailed descriptions. Some St Bernard puppies for sale may be shipped Worldwide and include crate and veterinarian checkup. Many St Bernard dog breeders with puppies for sale also offer a health guarantee. With thousands of St Bernard puppies for sale and hundreds of St Bernard dog breeders, you're sure to find the perfect St Bernard puppy.